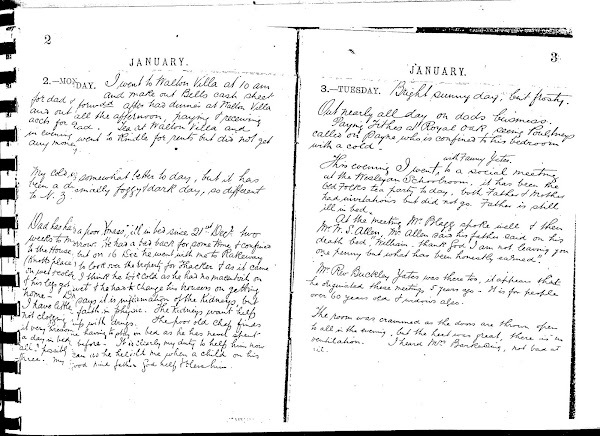 This is my great grandad John Alcock's diary, which he wrote in Cheadle, Staffs, England in 1888. John was born in Cheadle in 1853, son of William Alcock (b. Longton) and Hannah Yardley (b. Horton near Leek). In 1877, he travelled to New Zealand, marrying Alberta Eccles (Bert) there in 1880. They had 3 children in New Zealand (Mary, Ethel and Ursula). They returned all together to Cheadle sometime between 1885 and 1887. Their son Walter was born in Bank Street, Cheadle, in 1887. If you find something interesting or want to get in touch, please leave a comment or contact me using the above contact form. I really enjoy hearing from diary readers. Morning - Out after Beer orders in town. Afternoon - In market and cutting and printing 400 school tickets for Diorama.